It seems like as entrepreneurs, we’re always out there trying to find that little hack, that little whatever it is to try to squeeze more out of our day. I think a lot of people are always looking for a productivity app or a productivity hack or this new vitamin to take or whatever it is. I was too. I’ve been through the whole thing. I’ve downloaded all the productivity apps and the to-do list things and found eating plans to do and all this fancy stuff. In the end, a lot of it boils down to our physiology, the way that our bodies work. Oftentimes, we’re actually working against ourselves or we’re out there trying to find these amazing tools that are placing patches over the top of what actually needs to be fixed. I’m going to be teaching you guys about the 3:00 PM energy slump, which you fully are already aware of, but I’m going to walk you through a couple steps in how to get out of that in your lives. When you can get out of that 3:00 PM energy slump, you have so much more energy, so much more creativity, so much more life to go out there and do what you want to do. Whether it’s spending time with your friends, your family, growing your business, being more effective in that time in your business. We’re going to walk you through how you get out of the 3:00 PM energy slump. First of all, I’ve got this little chart here, and this chart is important because after I walk you guys through this process, I want you guys to create your own chart. I’m going to show you guys how and why that’s so important because my chart is not your chart. 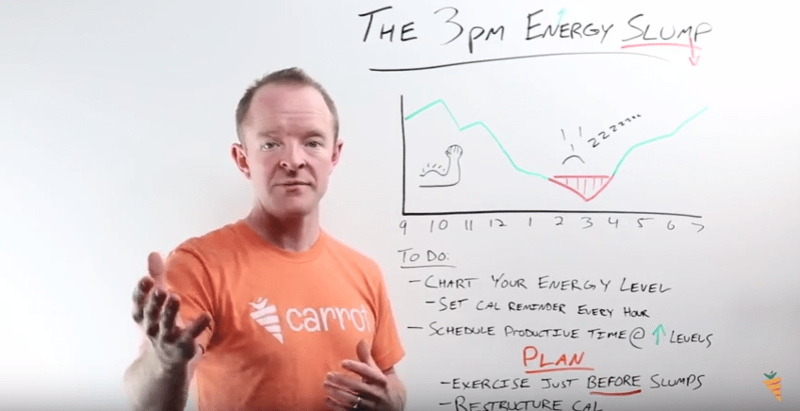 You guys might have a ton of energy at 3:00 PM, but your energy might slump at a different time during the day. This chart is basically the chart of mine. Are you dozing off while reading this post? You’re in an energy slump. Beat it by following these simple tips to restructure your day and create the right mindset. I’m going to walk you through the process. I charted my energy level at every hour during the day for several days to find out when my energy was low and when it was high. That way, you can structure your life better and also tackle those low energy times and infuse more energy in them. I start at a pretty high energy level, but not when I first get up. When I first get up at 6:30 in the morning or when one of my kids is upstairs yelling to try to come downstairs, I’m not too high energy there. But what I do is I go through some steps to get high energy by 8:30 or 9:00 in the morning, oftentimes earlier. I get to work at about 8:15 in the morning, get really high creativity at that time, and I peak right there, and then my energy starts to steadily go down throughout the day, all the way up until 3:00 PM. For me, it’s oftentimes because I’m at my desk sitting, standing, sitting, standing with my stand up desk during this time. I’ve kind of gotten the roll of the day. The excitement of starting the day off has waned a little bit. I’ve kind of gotten my to-do-list, and then I ate lunch, got a belly full of food that might not be good energy food, and then you start to hit that lull. During that lull is when I’ve learned to try to shock your system back into place so you can get through that as quick as you can, so you can go back into a high energy state. For me, same time, it’s about 4:00 or 5:00 PM that I get a little bit higher energy. It’s kind of funny. Around 8:30, 9:00 PM, I’m pretty darn good, and then about 10:00 PM, I’m done. Okay, so what does your chart look like? I want you guys to chart your energy the next three days, and that’s it. It’s going to be really, really easy. Chart your energy the next three days. I want you to set a calendar reminder. Do it before you finish the video. Hit pause in this video in about ten seconds, after I tell you what to do. Set a reminder for every hour during your workday to gauge your energy level for the next three days. We’re talking nine to five, eight to whatever, whatever time is your work day. Set a calendar reminder that pops up and says, “What is your energy level?” Jot it down on a spreadsheet, a piece of paper, whatever. You can gauge your energy level in any way you want. You can do one to ten, you can do high, low, medium, however, you want to gauge it, gauge your energy level. Write it down. After those three days, you’re going to make your own chart. It’s going to show you when your energy is high and when it’s low. The high energy parts, figure out why it’s high, and write that down, and do more of that. Fit more of that in your schedule. The low energy times, oftentimes we don’t know why we have low energy at that time, and this is what we need to do to tackle that. We need to, first of all, schedule your productive time. It could be the time that you’re creative. It could be the time that you’re just doing the best work, the stuff that really makes a difference for you, the stuff you’re great at. Schedule that during your high energy level times. For me, right now doing this video, it’s before lunch. I haven’t eaten lunch yet. I know I’ve got good energy at this time. That’s why we’re doing our videos right now. 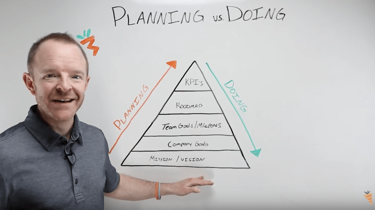 If I were to schedule these videos at 2:00 or 3:00, even after I go through some of these steps to get my energy level up, it’s still going to be a little bit lower than normal, so scheduling your productive time during high energy times. All right, now here’s the plan for you. What you want to do is exercise just before the energy slump. It doesn’t mean you’ve got to go pump iron. It doesn’t mean you have to go run ten miles. Get outside, walk outside out of your house, walk outside of your office, and walk around the block. Walk a mile. That could be a really good, simple goal, just to walk a mile. It might take you fifteen, twenty minutes to walk a mile, maybe quicker. Do whatever works for you for exercise. It could be literally doing 15 jumping jacks in your office and just getting going. Set that in your calendar to do a quick exercise, ten minutes or so, just before the slump happens. Next, what you’re going to do is restructure your calendar. So put exercise on your calendar right before your slumps usually happen, a quick, simple exercise, ten, fifteen minutes max, just to get that going. You could go longer if you want to. I’ve even seen some people do a quick five-minute exercise and it gets their energy level going back again. Everyone’s got five minutes, and that one five minute exercise is going to give you an extra two or three hours of productive and happy time during the day, which is a great investment. Now, you’re going to figure out your eating and drinking. It’s kind of funny. We just ordered lunch. Nate, the cameraman, just got a bacon cheeseburger, so I’m going to put him on the spot. I know for me, if I had a bacon cheeseburger with fries, I’m going to be in the sleepy zone in about two hours. Usually, it’s about 45 minutes after I eat something like that. For me, it’s high carbs. It just puts me in the gutter, so instead I got a salad. I’m not better than Nate. I just know where my energy levels are and I don’t want to be there because I’ve got a lot to get done today. Make sure you change your eating and drinking patterns. Also, drink a bunch of water, which I’ve been really bad at lately. That’s something I myself have to challenge myself to get back on that train of drinking a lot of water at the start of the day, and drinking a bunch of water also before your energy slump happens. If you guys go out there and do those things in your life and in your day, which it takes discipline, it does, but if you like having that energy slump and if you like giving away two, three, four hours of your day each and every day and not having that productivity or that happiness, that same energy level, that’s cool. Keep doing it. If you want to gain that time back that you’re never going to get back, find some ways to figure out your energy cycle. Restructure your calendar so it fits the productive stuff around that energy cycle.Then find ways to reignite your body just before those slumps happen so those slumps become less and less. You want those slumps to go from being low, to leveling out. That’s what’s going to happen when you guys implement this. Go out there, get more energy in your life, more energy in your day, and go out there and crush it. 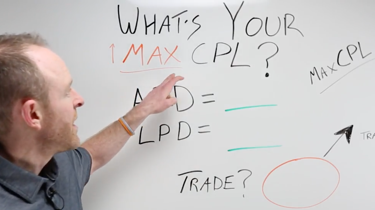 Let us know how it works in the comments section of the YouTube video or the comments section on the blog post, and we’d love to hear your feedback. Thanks, guys and gals. 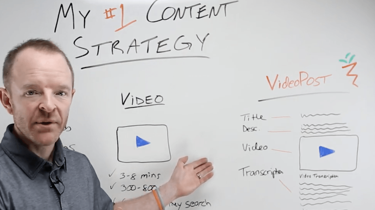 Go visit our other whiteboard strategy sketches on our YouTube channel, or subscribe here to the blog. Thanks, guys and gals. Go out there and crush it. Might I also highly recommend incorporating coconut oil (organic, virgin, cold pressed). I have been for a couple months now, and man, very noticeable results in both diet/hunger, cognitive function, and the big one ENERGY! Spoonful in my coffee, blend it, and off to the races. Many many more benefits to coconut oil/MCT oil than you’d imagine. Also, a big one for me too is the carb thing. I simply cannot deny the negative effects carbs have on my body.